The place where competitors arrive three times a day for maintenance. You will be closer to drivers than in any other motor sport event. Drivers will have some time to share with fans and with some luck you can get their autograph and even take a picture with them. 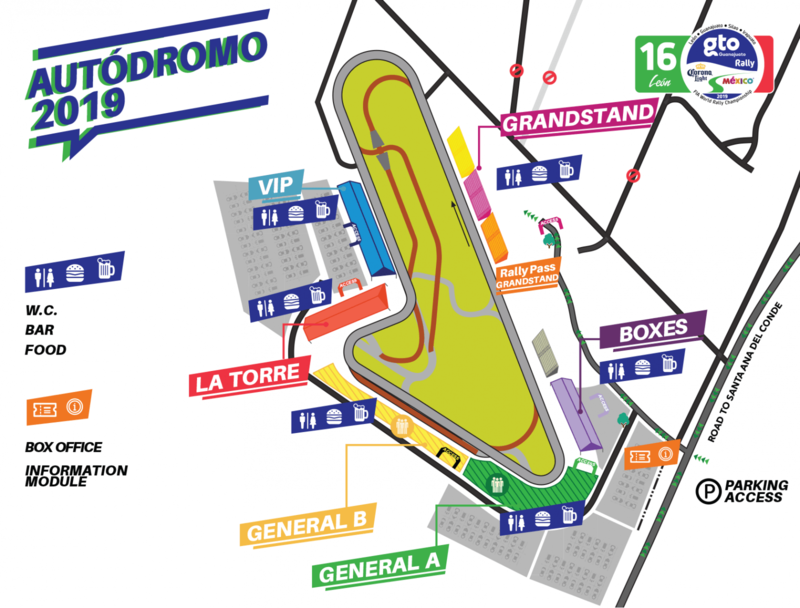 With your general admission ticket you will be less than 5 meters from mechanical service of the competition cars, visit our sponsors stands, buy souvenirs, and participate in spectator designed activities. The new food court will surprise you with its gastronomic offer and live music. It is the best place to enjoy this great event with your family. We are sure you will be surprised with everything we have prepared for you. RALLY CAMPUS 1 DAY, ADULT $60 + $15 ticketing fee RALLY CAMPUS access 1 day. Does not include access to Street Stage Leon and Rock & Rally. RALLY CAMPUS 1 DAY, CHILDREN $45 + $15 ticketing fee RALLY CAMPUS access for 1 day. Children under 1.2 meters tall pay Child Ticket at a discounted price. People over 60 years old with INAPAM credential also pay Child Ticket.Does not include access to Street Stage Leon and Rock & Rally. RALLY CAMPUS 4 DAYS, ADULT $165 + $15 ticketing fee Unlimited access to Rally Campus the 4 days of the event. You must exchange it for a bracelet at the Information Module at Olimpo Street Access or Vasco de Quiroga access. Does not include access to Street Stage Leon and Rock & Rally. RALLY CAMPUS 4 DAYS, CHILDREN $115 + $15 ticketing fee Unlimited access to Rally Campus the 4 days of the event. 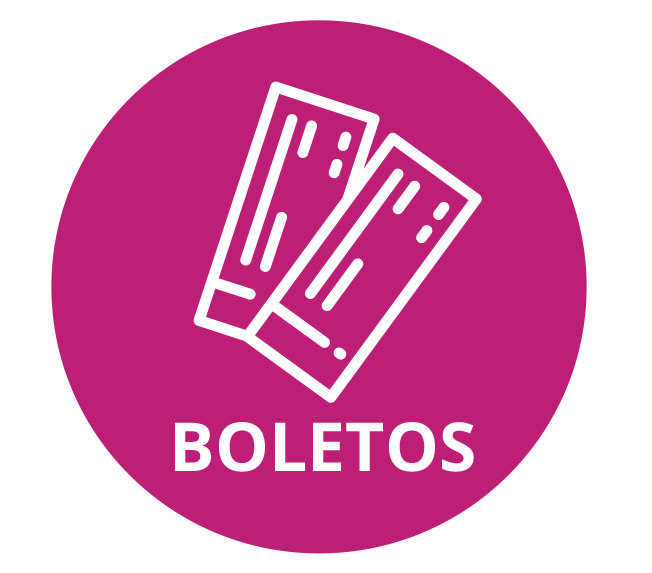 You must exchange it for a bracelet at the Information Module at Olimpo Street Access or Vasco de Quiroga access.Children under 1.2 meters tall pay Child Ticket at a discounted price. People over 60 years old with INAPAM credential also pay Child Ticket. Does not include access to Street Stage Leon and Rock & Rally. One of the stages with easy access. 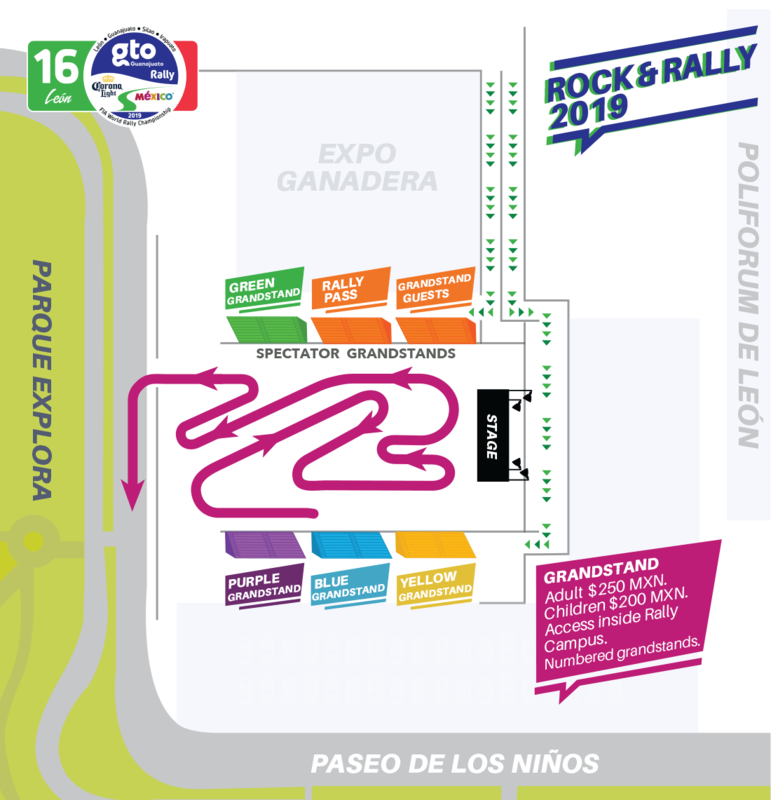 Competition takes place in Velaria de la Feria, inside Rally Campus. You don’t need to leave the city to feel the emotion of the rally. We recommend buying your grandstand tickets on presale so you can choose your seat in one of the 6 grandstands. Grandstands are numbered, please respect the seats. LEON STREET STAGE FRIDAY, ADULT $200 + $15 ticketing fee Access to grandstand in Street Stage Leon – FRIDAY 8th. Numbered grandstands. LEON STREET STAGE FRIDAY, CHILDREN $160 + $15 ticketing fee Access to grandstand in Street Stage Leon – FRIDAY 8th. Numbered grandstands. Children under 1.2 meters tall pay Child Ticket at a discounted price. People over 60 years old with INAPAM credential also pay Child Ticket. In the Velaria de León inside Rally Campus. A competition stage with live music, lights and fast cars. This stage combines racing cars with a live rock band. ROCK & RALLY SATURDAY, ADULT $250 + $15 ticketing fee Access to grandstand in Rock & Rally – SATURDAY 9th. Numbered grandstands. ROCK & RALLY SATURDAY, CHILDREN $200 + $15 ticketing fee Access to grandstand in Rock & Rally – SATURDAY 9th. Numbered grandstands. Children under 1.2 meters tall pay Child Ticket at a discounted price. People over 60 years old with INAPAM credential also pay Child Ticket. 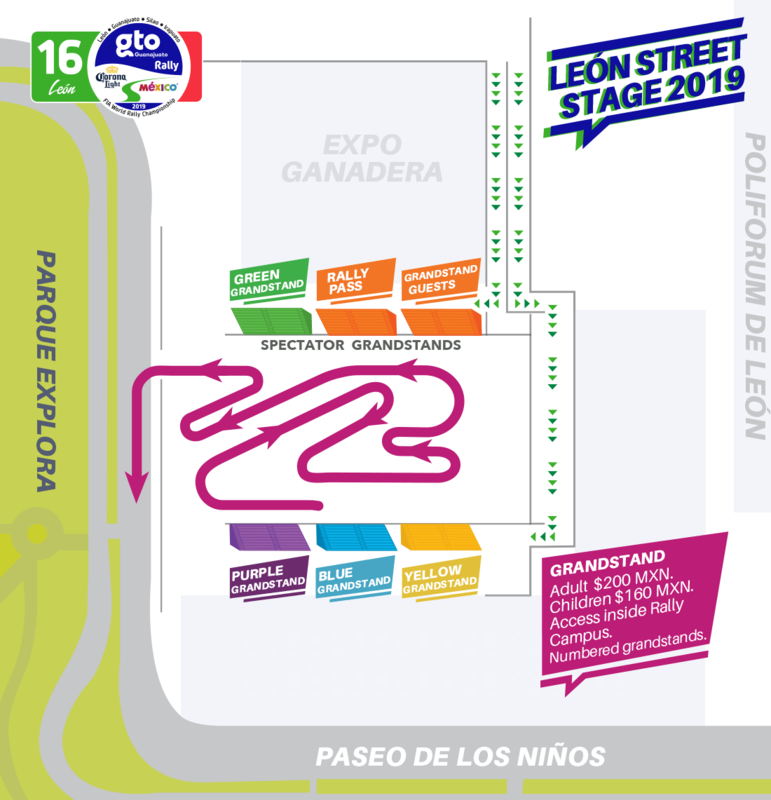 Super Special Stage that takes place in the León Racetrack, where you can watch the cars at great speed competing head to head on double track. This tricky stage has jumps, splashes, and an electrifying crossover for the 2 cars on track to give the best show. All competitors will be paired twice for a two hour show. The only stage where you can directly compare the performance of the cars and the expertise of the drivers. Parts of high speed, sharp turns and impressive jumps is what you have to expect in this stage. It is run twice, on Friday 8th and Saturday 9th. Perfect for people who can’t attend the road stages, and combined with the visit to Rally Campus, will find an excellent way to enjoy the event. General A – View of the entire racetrack, next to the fastest curve. Includes access to general area, without a seat. There is a hill in this area which guarantees good view for all the spectators. Access with drinks and food is not allowed. General B – Great view of the curves and the second jump of the track. Includes access to general area, without a seat. Access with drinks and food is not allowed. Grandstands – Great atmosphere with the best view of the crossover jump, and in front of the start and finish line. Includes access with numbered seating and elevated view. Access with drinks and food is not allowed. Boxes – Covered boxes for 4 and 8 person, chairs, tables and waiter service. Located in the finish straight. Boxes are numbered and you can only buy a complete box (4 or 8 persons). Drinks and food have an extra cost. • La Torre – NEW AREA! Literally is a double deck tower, an exclusive area to enjoy the rally with the best view and VIP service for spectators. In an elevated structure with two floors, the first one at 2 meters from track level and the second at 4.5 meters. You will have a perfect 360o view of all the track. Snacks and national open bar included (3 hours). Bartender and waiters to bring you an excellent service. GENERAL A, ADULT $120 + $15 ticketing fee No seat included. GENERAL A, CHILDREN $85 + $15 ticketing fee Children under 1.2 meters tall pay Child Ticket at a discounted price. People over 60 years old with INAPAM credential also pay Child Ticket. No seat included. GENERAL B, ADULT $90 + $15 ticketing fee No seat included. GENERAL B, CHILDREN $65 + $15 ticketing fee Children under 1.2 meters tall pay Child Ticket at a discounted price. People over 60 years old with INAPAM credential also pay Child Ticket. No seat included. GRANDSTAND, ADULT $250 + $15 ticketing fee Numbered grandstands, buy your ticket NOW!. GRANDSTAND, CHILDREN $250 + $15 ticketing fee Children under 1.2 meters tall pay Child Ticket at a discounted price. People over 60 years old with INAPAM credential also pay Child Ticket. Numbered grandstands, buy your ticket NOW! HALF BOX $2,600 + $15 ticketing fee There are no child tickets for this section. Children over 3 years old need a ticket to enter (only 1 children under 3 year allowed in each half box). Includes access for 4 persons, food and drinks have an extra cost. FULL BOX $5,200 + $15 ticketing fee There are no child tickets for this section. Children over 3 years old need a ticket to enter (only 2 children under 3 year allowed in each complete box). Includes access for 8 persons, food and drinks have an extra cost.